On the 5th day of my holiday in South Korea, back in October 2009, I went to Seoraksan National Park (설악산국립공원). Seoraksan is located in the north-east of South Korea, so I had to take a bus from Seoul (where I was staying) to Sokcho, then a bus from there to the park. 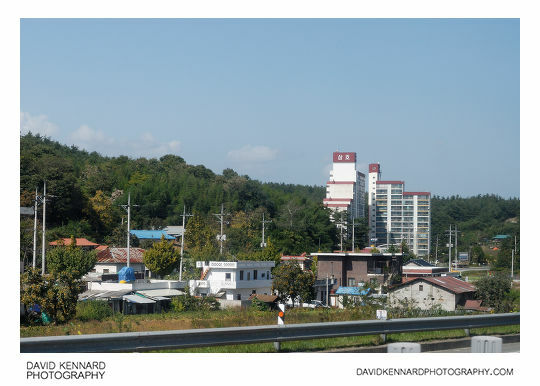 I took a few photos on the bus as we were coming up towards Sokcho. They're not particularly great as they were shot through the bus window, and obviously the bus was moving as I took the photos. But hopefully they give a view of some parts of Korea that tourists wouldn't normally bring back photos of. I spent a long time manually geo-coding these photos, as I didn't have my GPS switched on while I was on the bus. You can see them all on the maps page of the website. The route taken by the bus, while I was taking photos, was north up the National Route 7 (Hangeul: 국도 제7호선; Hanja: 國道第七號), a dual carriageway that runs along the east of South Korea. 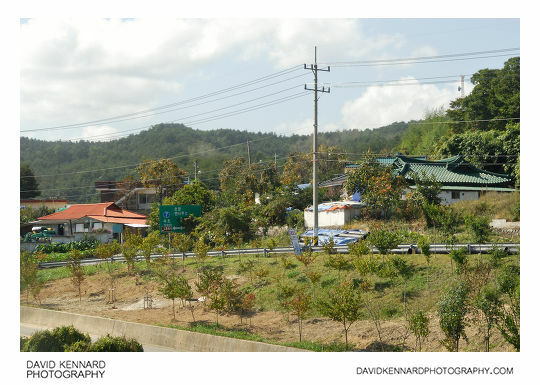 This post covers photos taken while going through the villages of Sonyang-myeon (Hangeul: 손양면; Hanja: 巽陽面), in Yangyang-gun (Hangeul: 양양군; Hanja: 襄陽郡). 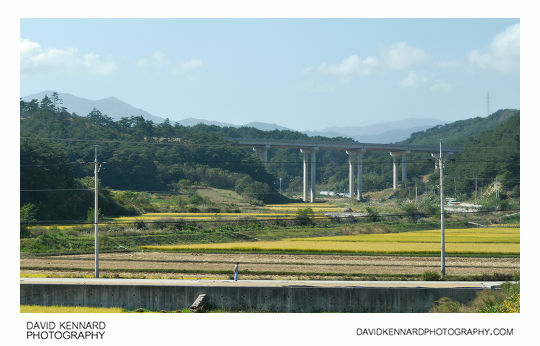 The photo above was taken as the bus travelled through Sangyanghyeol-ri (Hangeul: 상양혈리; Hanja: 上陽穴里). You can see a large bridge in the background, which doesn't exist if you look at the google maps satellite imagery, so I think it must have been built relatively recently. If you look carefully you can see a tractor a couple of fields in front of the bridge. This gives an idea of just how large the columns holding up the bridge are. Similarly, the person standing on the road in the foreground gives the sense of scale to the poles by the side of the road. If the person wasn't there you might only think they were as big as a standard lamp-post. A bit further on and we come to the village of Hawangdo-ri (Hangeul: 하왕도리; Hanja: 下旺道里), above. Unlike most English villages, Hawangdo has a couple of large apartment buildings, the Samho Apartments (Hangeul: 삼호아파트). Presumably this is due to its location alongside National Route 7, making commuting to a city or town relatively easy. Large modern developments in South Korea often consist of many of the same design of building grouped together, but above you can see that older buildings are quite haphazard in their design style. In the UK, even for older towns and villages, you normally get buildings built in the same style grouped together, such as a row of red brick cottages, or maybe a street of pebble-dashed semi-detached houses. But it seems in Korea that they don't tend to take much notice of the style of surrounding properties when building a new house. The above photo was taken a bit further along, looking down a road in a different part of Hawangdo-ri. You can see red and green tiled roofed homes here. 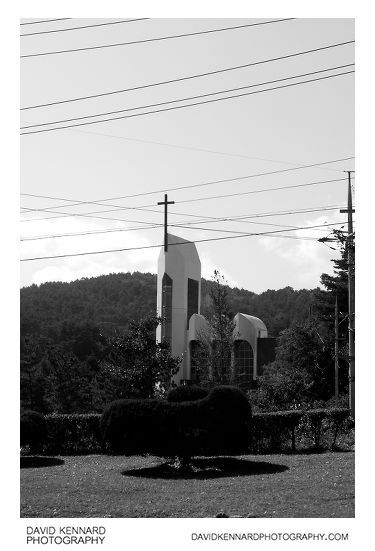 Further on, we can see Chungyong Church (Hangeul: 충용교회) from the road, a building that is quite architecturally distinct. The Church is located in Gan-ri (Hangeul: 간리; Hanja: 間里). Strangely, this church appears on google maps, but not on Daum Maps or Naver Maps. The map to the left side of the road appears quite different in each map. I would guess this is because the Republic of Korea Army 8 Corps Headquarters are located in this area, and the Korean maps have probably censored this while Google haven't.